Cloud computing is here. Companies are increasingly using various cloud services to make everyday activities easier and more efficient. These advantages don’t however come without downsides – the real price for flexibility is lack of control, increased risks of human error and technological complexity due to various outsourced authentication methods and practices. Stonesoft a2cloud is designed to remove these downsides and make the life truly easier and more secure. In short, Stonesoft a2cloud revolutionizes how companies access the cloud. It is a perfect answer to the security needs of organizations using any cloud. Just say no to expensive authentication gadgets or hard tokens. We are very happy to invite you to join Stonesoft’s brief webcast to learn how to Stonesoft a2cloud allows you authenticate to any cloud faster, easier and in total security with Single Sign-On. Ari Vänttinen, VP Stonesoft Corp. The industry’s first transformable security engine is here! 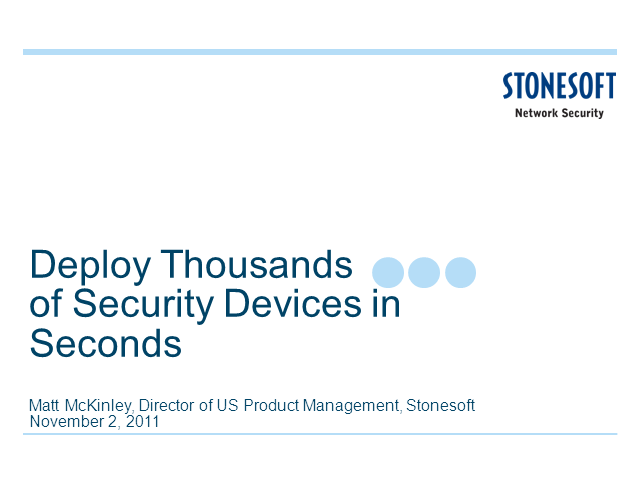 The Stonesoft Security Engine changes how network security is delivered. Unlike traditional security products, the Security Engine is one solution that delivers the adaptability, agility and scalability of a service. The Stonesoft Security Engine is the industry’s first transformable security engine delivered in a single, highly adaptable solution. The Stonesoft Security Engine is a first-of-its-kind security solution that, depending on the user’s preference, can be configured to act as one or several different product modes simultaneously – including a traditional and/or next generation firewall (NGFW), traditional and/or next generation intrusion prevention systems (IPS/NGIPS), layer-2 firewall, VPN or UTM product. All needed security capabilities and performance improvements are made available and integrated in the Security Engine. That means that not only are you always up to date and protected, you don’t have to buy new products when business needs or the threat environment changes. Instead, you decide, define, choose and configure your own security model – and can change it at any given moment. Is your business geographically distributed? Is secure and resilient connectivity a must? Is the low cost alternative preferred? Is ease of management essential? Meet the network security experts, organizations and industry thought Leaders to hear the latest insights, research and solutions of Network security. These Webcasts introduce very practical ideas, thoughts and advice how to overcome network security challenges.